At Mondello Publishing we love stories of adventure back in the days of "iron men and wooden boats". We specialize in sailing and canoeing, particularly in small boats. Here you'll find rare books now re-issued in e-book format. Don't have a Kindle/Nook/Kobo? No problem. Amazon, B&N and Kobo all provide free reader apps for desktop computers, tablets, and smartphones. We've put links to many of these on our FAQ page. John MacGregor was a Scottish lawyer who singlehandedly launched the sport of “canoeing” to the general public in the 19th century. His many travels through Europe, North America, and the Middle East were popularized through a series of travel books detailing his adventures in his canoes and small boats, each named “Rob Roy”. 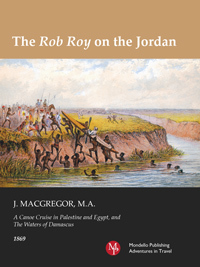 The Rob Roy on the Jordan is the story of his final adventure, an expedition-style canoe (kayak to us) trip down the Nile, then through the Holy Lands, in what is now Lebannon, Jordan, and Syria Accompanied by his faithful dragoman Hany, Mr. MacGregor evades Arab kidnappers, clambers over ancient ruins, searches for mummies, and all the while maintains detailed and lively records. As an accomplished artist, the author also ensures that each chapter is accompanied by vivid woodcut illustrations, with over ninety total in this book, along with eight maps. Original page count: 474. The Log of the Viper - excerpted from Cruises in Small Yachts and Big Canoes. He didn't cross vast oceans, battle mighty storms, or travel to exotic ports of call. But H. Fiennes Speed's summertime adventures "gunkholing" around the south of England, during the glory years of the Victorian era, present a fascinating insight to the brith of small boat sailing as a sport. So many of the author's travails sailing his 20 foot long Viper will be familiar to small boat sailors today. This volume is copiously illustrated with the author's original line art as well as detailed charts from the original. This book was carefully edited from the original text and the images were captured via photo-quality scans of a first edition print. The cover photo shows the Erith yacht club it looked around the time of writing. This is the third and largest log of a three part logbook. The first two log books from H. Fiennes Speed's summertime adventures including a cruise from London to Rotterdam in a 16 foot sailing canoe, during the glory years of the Victorian era. Extensively illustrated with original maps and lively pen and ink drawings. Includes cruises along the Thames and coastal cruising in the South of England. Specially formatted for all Kindles including Kindle Fire and Kindle for iPad, as well as the Kobo and Nook readers. Erith Yacht Club (U.K.) The Erith Yacht club is one of London's oldest small boat sailing yacht clubs and is located on the tidal Thames, in Bexley, within easy access via the M25. This club features prominently in the Logs of the Watersnake and Water Rat and The Log of the Viper. Royal Canoe Club (U.K.) The Royal Canoe Club, located on the Thames, at Teddington, is the world's oldest canoe & kayak club. It was founded by a group of Englishmen who met at London's Star and Garter hotel, under the guidance of John MacGregor, the author of The Rob Roy on the Jordan. When Edward, Prince of Wales, became commodore in 1874, the club became the Royal Canoe Club, and it has retained this name ever since. Canoe & Kayak Magazine - the name speaks for itself.